I spend several Fridays throughout the semester working with a family medicine physician (who I call Dr. Spock on this blog) and while I sometimes have to grumble a little bit on the hour or so drive there (because you know, it's Friday afternoon, it's 80 degrees and sunny, and everyone else is taking a break), somehow we always see at least one case that is a perfect example of what we're studying in class right now and I always leave feeling rejuvenated about medicine. o were directly affected by these problems - I even got to interpret a flow-volume loop of a woman who had vocal cord dysfunction (small inspiratory volume, with no real change in the expiration curve) which we had just learned TWO HOURS EARLIER! in class. Afterward, I was talking with Dr. Spock about interstital lung diseases - a category of lung diseases that affect the thin membrane between your alveolar sacs (the ends of your air tubes) and the capillary network (that carries the blood that gets oxygenated by the lungs). They keep telling us that the scariest lung disease is not lung cancer but this interstitial lung disease called "idiopathic pulmonary fibrosis" where people classically have a wheeze at the end of inspiration. They also add in a few completely random diseases that we'll probably never see (and will therefore most likely be on our Boards exam in February?!?) - including Silicosis, a type of interstitial lung disease that one gets from working in a quarry with silica. This is very rare and even more rarely dangerous except that it reactivates latent TB. But why do we care - TB is super rare in this country and silicosis is even more rare. Well, it just so happens that Dr. Spock's office is located in "The Granite Capital of the World" and silicosis used to be incredibly common there. During our conversation he suggested (or assigned?) 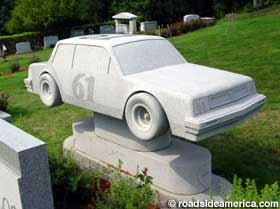 that I go check out Hope Cemetery. peaceful, but hardly quaint - because everyone in the cemetery worked with or knew someone who worked with Granite, it's more like museum or a sculpture garden than a cemetery. 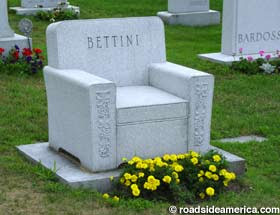 There are graves that look like Rodin scuptures, graves that are full size cars or chairs or soccer balls. There's also a section where everyone died in 1918 (any guesses as to why?) and another where many people died in the 30s (apparently this is from silicosis/tuberculosis). Check out the photos. I wandered around for forty minutes or so looking at all the beautiful graves, embracing the oh-too-infrequent pause in what has otherwise been an incredibly busy day (week? month? year?). "We all die. The goal isn't to live forever; it's to create something that will"